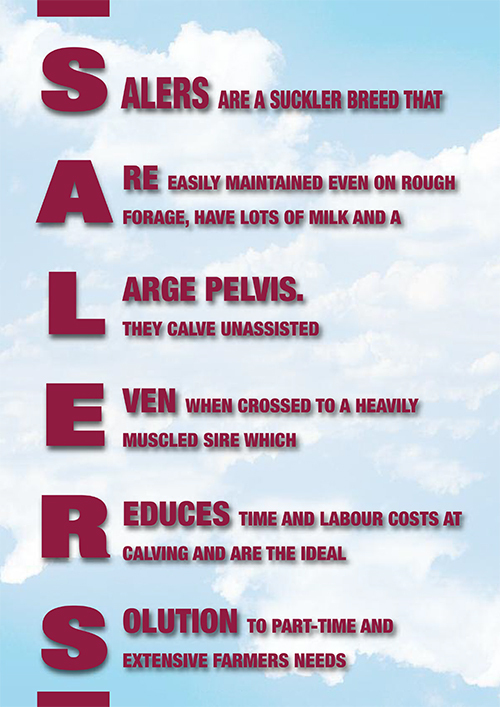 ALL ENTRIES IN SALERS CLASSES MUST BE 100% FULL BLOOD, REGISTERED WITH THE SALERS CATTLE SOCIETY OF IRELAND. Cow class is any female that has had a calf. Senior Heifer born on or after 1st September 2016 and before 1st September 2017. Junior Heifer born on or after 1st September 2017 and before 1st September 2018. Tullamore Show will have a Bull class any age. If we have numbers we will have a Junior Cow Class, born on or after 01/09/’15 at Tullamore Show. ALL IRELAND CALF CHAMPIONSHIPS held at Tullamore Show on Sunday 11th August. Senior Calf class: Bull / Heifer born between 01/09/’18 and 31/12/’18. Junior Calf class: Bull / Heifer born on or after 01/01/’19. 1st €200.00. 2nd €150.00. 3rd €100.00. Calf must have previously been shown in a Salers Calf Class in at least one Show before Tullamore Show. Points are awarded to the 1st, 2nd and 3rd cow at Regional shows and the cow with the most points wins. Congratulations to last years joint winner Alfred Melvin, Ashbury Herd, Dublin and Thomas Mulcahy, Glenmore Herd, Limerick. Alfred was presented with the Brian Halton Memorial Cup at our Dinner Dance and will keep it for 6 months them Thomas will receive it. In the event of a tie at the end of the regional shows, the winner will be the cow that got the most points at Tullamore Show. SPRING PEDIGREE SHOW AND SALE 2019 G€NE IRELAND STRAWS.